FusionCast combines metal (50% by weight) and very High Density Urethane (HDU) that is bonded at the molecular level. Your sign is chemically fused with the metal at the front of a sign or plaque where it can be seen and felt while providing a durable substrate of HDU towards the back. Ideally suited for outdoor use, it's where they excel! High density urethane has been used in the space industry for its toughness and ability to withstand heat, impact, abrasion, flex fatigue (won't warp) and strength. It's also non-marking, impervious to stains, mold, mildew and fungus. These signs won't crack or peel in wintery frost weather, nor buckle or fade in the blistering heat of summer and direct sunlight. The Flex Strength, psi, FusionCast HDU is just over 4 times stronger. 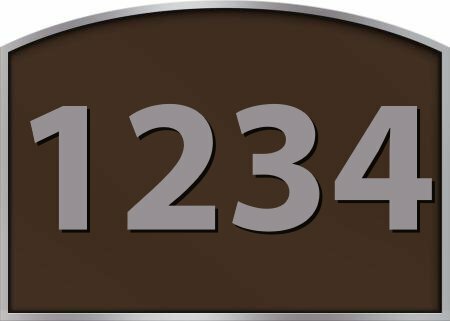 CUSTOMIZED HOME ADDRESS PLAQUE: Improve "curb appeal" of your home, always looks as good as the day you got it! Please contact seller directly for customization options. PATENT-PENDING: The secret is our patent-pending formula that combines metal and high density urethane or HDU that is bonded at the molecular level. Our signage and plaque solutions use less metal so right off the bat you're saving money on raw material costs which can be pretty high if you're specifying expensive metals like bronze or copper. STRONG & LONG-LASTING: Our signs are ideally suited for outdoor use, it's where they excel! Our signs are know for their toughness and ability to withstand heat, impact, abrasion, flex fatigue (won't warp) and strength. It's also non-marking, impervious to stains, mould, mildew and fungus. Our signs won't crack or peel in wintery frost weather, nor buckle or fade in the blistering heat of summer and direct sunlight. MAKES FOR A GREAT GIFT: Do you know a brand new homeowner? Surprise them with FusionCast's Customized Home Address Plaque! WARRANTY: Replacement Warranty for 10 years from date of purchase. Warranty valid for manufacturing or material defects. Customer must send product back to be eligible for replacement at their own expense. Seller has the final say to determine eligibility for replacement. If you have any questions about this product by FusionCast, contact us by completing and submitting the form below. If you are looking for a specif part number, please include it with your message. Baldwin Estate 90670.003.CD Solid Brass Traditional House Number Zero in Polished Brass, 4.75"